He gave his country its name and gave West Africa inspiration for democratic reform. 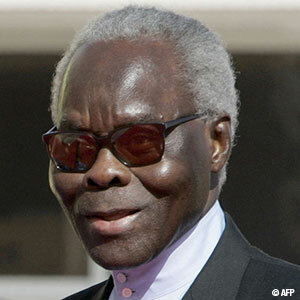 Benin has declared a week of mourning for former President Mathieu Kérékou, who died on 14 October in Cotonou. He was 82 years old. Kérékou was born in 1933 in what was then the French colony of Dahomey. He attended military schools both at home and in France while rising through the ranks of the army. As a lieutenant colonel, Kérékou seized power in a military coup in 1972. Soon after, he declared a one-party Marxist state and renamed the country the People's Republic of Benin. Over the course of his 17-year rule, he lived up to his nickname "the Chameleon" by abandoning Marxist ideology and agreeing to hold multi-party elections. When he lost the vote in 1991, Kérékou stepped down, a move that inspired democratic movements across West Africa. In 1996, Kérékou was returned to power in through the ballot box; he was re-elected in 2001. At the end of his second mandate, Kérékou announced that he would not challenge constitutional term limits in order to remain in power. "If you don't leave power," he is quoted as saying, "power will leave you."